The Lake Havasu Area Chamber Ambassadors held a ribbon cutting ceremony for the London Bridge Raceway Park Headquarters & Information Center celebrating its grand opening. 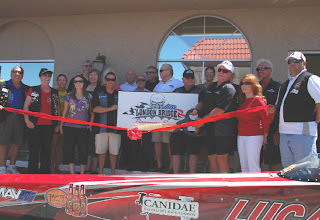 Attending the ribbon cutting were Tom Otero, Linda Sugamele, Crystal Alger, Cassie McShane, Jeanette Luhr, Charlie Cassens, Scott Ward, Ed Eastridge, Mayor Mark Nexsen, Larry Huff, Bill Doner, Bob Gregg, Kelli Ward, Denny Cissell, Bonnie Cissell, Nick, and Dennis Weuve. The center is located at 52 S. Lake Havasu Ave. and will be open Monday-Friday from 10am to 4pm and Saturdays from 10am to 2pm. For more information contact them at 928-854-7223.